The Brewers have advanced to the National League Championship Series. Their pitching staff carried the series as Craig Counsell’s out-getters gave up two runs in the three-game sweep of the Colorado Rockies. As a team, the Rockies mustered only twenty-two baserunners over twenty-eight innings while striking out thirty times. Outside of a nerve-wracking Jeremy Jeffress inning in Game 1, the Rockies were held in check throughout the series. Since the Brewers ended their series early and we don’t know whether they’ll be hosting the Atlanta Braves or Los Angeles Dodgers on Friday, here are six notes from the series, one for each run scored in Game 3. Jeremy Jeffress struggled in his Game One appearance. The Rockies started the inning with three singles, then an Orlando Arcia error allowed a fourth straight runner to reach base before Jeffress settled down and recorded the next three outs. Looking at his pitch plot, he spent too much time in the strike zone. About sixty percent of Jeffress’ pitches are sinkers or curveballs. 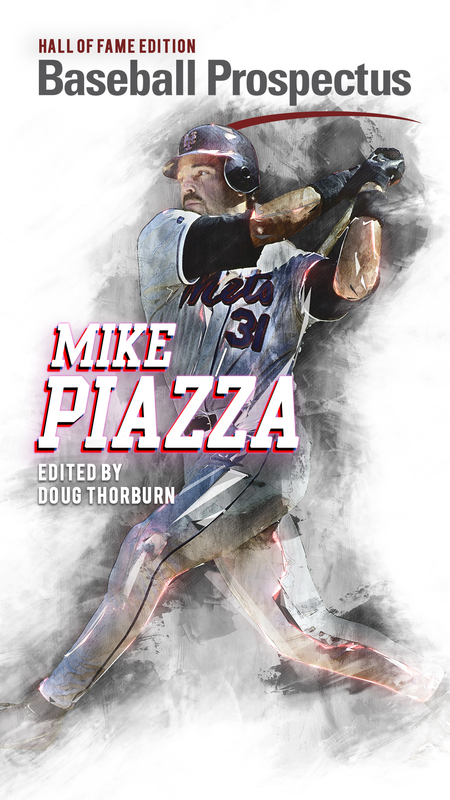 His approach is to keep the ball low, either inducing swings on balls below the zone or living in the bottom third, extending from the middle to wide of the zone. The intent is even more pronounced when the sinker and curveball are isolated. Whether due to playoff jitters or just poor placement, Jeffress threw two sinkers that caught much more of the plate than he intended. The playoffs are a heightened atmosphere where each mistake is magnified and takes on an outsized importance, but as his subsequent two scoreless appearances showed, this was one bad outing and there doesn’t seem to be a flaw that could come back to haunt Jeffress. His fourseam fastball velocity was slower than in any outing since April, but it ticked back up in Game Two and Three, and none of his other pitches showed any decrease in speed. There seemed to be some loss of horizontal movement, but the two pitches with the biggest drops were his sinker and curveball, which also rely on vertical movement for their deception. The sinker moved more than ever, while the curveball did suffer some loss in vertical movement. Even taking into consideration his unexplained medical absence from the NL Central tiebreaker game, I think that there’s not much cause for concern with Jeffress. The team immediately inserted back into high pressure situations and he’ll continue to contribute as a back end member of the bullpen. One of the major storylines coming into the series centered on how the Brewers would handle Trevor Story. Single season numbers against a team are too small of a sample size to be regarded as having any type of predictive value, but Story’s .333 batting average /.387 on-base percentage /1.222 slugging percentage slash line, which included seven home runs in seven games, worried some fans and pundits and became a talking point after the Rockies won the Wild Card Game. It turned out that no one needed to worry, the Brewers executed their plan perfectly. They planned to keep the ball out of the strike zone and dare him not to swing. During the regular season, Story swung at thirty-two percent of the pitches he faced out of the strike zone. That number went up in the NLDS. The Brewers kept the ball low and away. The approach was best exemplified by his at-bat against Jeremy Jeffress in Game 1. Jeffress had run into some trouble and Story came to the batter’s box with runners on first and second with two outs and a chance to win the game with a hit. Jeffress threw three curveballs, none of which were particularly close to the strike zone, and Story waved at all three pitches. Story finished the series 2-for-12 with six strike outs and one of his hits came in the bottom of the ninth in Game 3 when the series had already been decided. This pitching staff can lock down any batter in the league and will be up for the challenge of whichever team emerges from the other side of the National League bracket. Josh Hader made fifty-five appearances during the regular season. He pitched on one or no days’ rest for sixteen of those outings. How often Hader will be used will continue to be a sub-plot throughout the postseason run. Hader pitched four times last week, including the tiebreaker game. If the gloves are off, it was inevitable that he would need to pitch on back to back days, which he hadn’t done since August. After throwing 1 and 1/3 innings in Game One, Hader was used in a high leverage situation in Game Two to get Milwaukee out of an inning with a runner on third base and two outs. His spot in the lineup came up in the next half inning and Jonathan Schoop pinch hit for him, so Hader only threw twenty-two pitches in the two appearances. He exceeded that number in more than half of his 2018 games. Hader added another seven pitches in Game Three and by finishing the series so quickly, he’ll get some extra time off. The middle of the NLCS includes three games in three days and it is unlikely that the Brewers can avoid using him in at least two of those games. The Brewers will need to hope that their regular season usage plan for Hader will keep him fresh for these important games. The Brewers finished in the top 10 in MLB in baserunning runs. The area where they far outpaced all of baseball was opportunities to advance on wild pitches, passed balls and balks. Milwaukee is an aggressive team on the base paths; they were top four in stolen base opportunities. There is value in putting pressure on opposing pitchers and defenses and giving them something real to worry about when a batter reaches base. However, the team could use this next week to tighten up their running game. There were a few baserunning gaffes against the Rockies. The competition will level up in this next round and beyond, and Milwaukee cannot give away outs on the base paths from ill-advised advancements. Jesús Aguilar struggled against the Rockies. He hit 1-11 with a walk a home run and four strikeouts. Aguilar started to scuffle in the second half, when he slashed .245/.324/.436, well below his first half line of .298/.373/.621. As the year went on, Aguilar’s absurd numbers against fastballs went down, but his power against non-fastballs completely fell off a cliff. Through the first two games, Colorado pitchers made sure to attack Aguilar low and away, which has been a season-long focus for pitchers. They also noticed the numbers in the above chart and gave him fewer fastballs to hit. 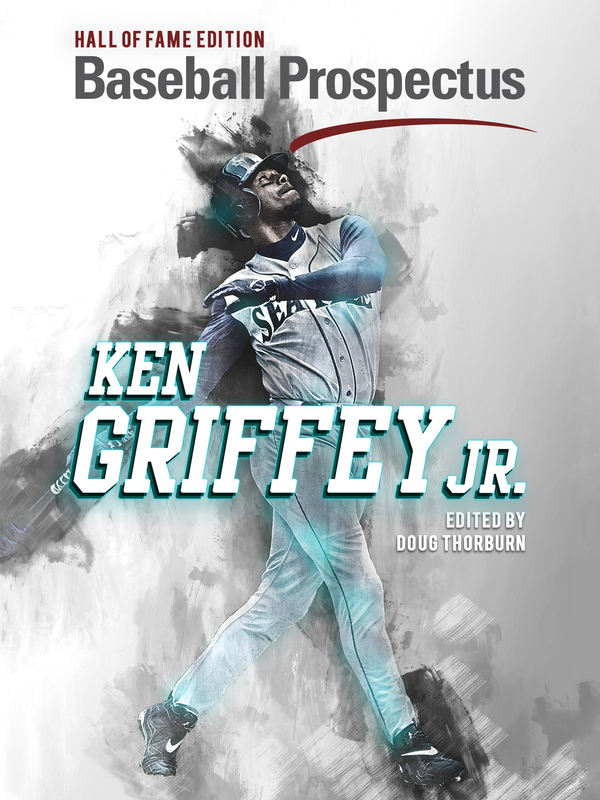 For the season, he faced around sixty percent fastballs and never dipped below fifty five percent for a month. Fewer than half the pitches he faced in the NLDS were fastballs. The best news for Aguilar coming out of the series is that his home run came off a curveball. To get pitchers to respect him again, he probably needs to start laying off those pitches as much as possible. The effect of pitchers going low and away is even more pronounced when fastballs are stripped out of the zone plot. Aguilar can’t dramatically improve his pitch recognition on the fly, but even something like taking any pitch that appears like it’ll go below his belt will help him out because right now decent breaking balls are giving him fits and it’s creating a hole in the lineup. Christian Yelich collected two walks in each game of the series. His regular season walk rate was 10.5 percent, but in the NLDS it approached fifty percent. In his second at bat of Game One, Yelich hit a home run off a poorly placed changeup. Pitchers had some success with changeups against Yelich in 2018, but all of them were inside or low; otherwise, Yelich had a good chance of hitting it far. After that, Rockies pitchers had their own plan to avoid getting hurt by Yelich. 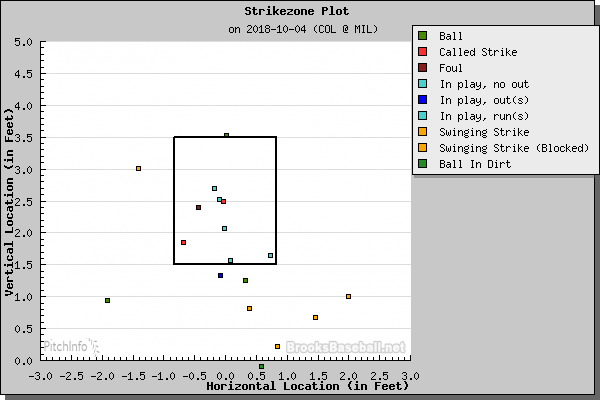 While pitchers generally looked to get inside on him or keep the ball low, Colorado was all over the place, so long as the pitch wasn’t in the middle of the zone. They seemed content to make Yelich chase bad pitches, or take a walk. He also saw more fastballs than in any other month in the 2018 season. To Yelich’s credit, he was willing to take the walks. Pitchers have had more comfort pitching this way to Yelich because Lorenzo Cain has struggled at the plate. He went 1-12 with two walks; Games 1 and 2 was only the second time he went hitless in two straight playoff games. If Cain can get on base, pitchers may feel more pressure to give Yelich pitches in or closer to the strike zone. If they don’t, then it gives Ryan Braun the opportunity to hit with more men on base. With Atlanta’s escape against the Dodgers last night, there’s a Game Four in that series (today, Monday, October 8). 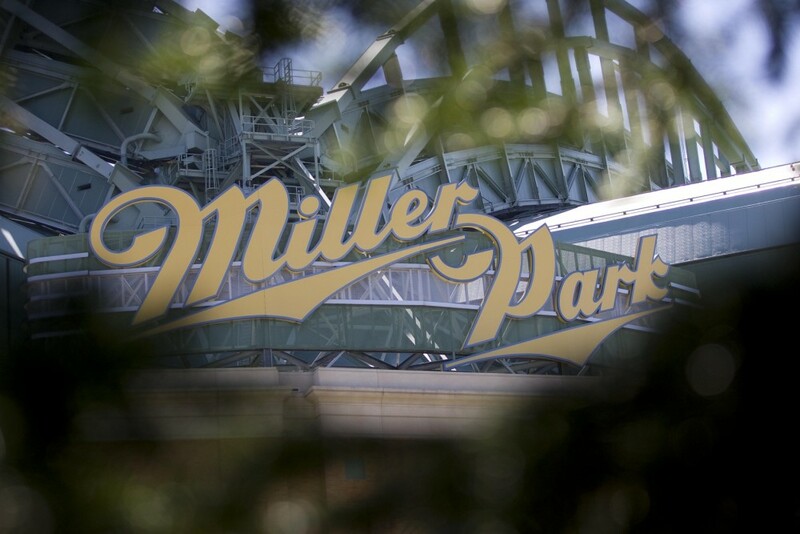 Brewers fans will want the series extended to a Game Five to ensure another cross-country trip for their eventual opponent. According to Baseball Prospectus’ adjusted standings, the Dodgers are the best team in the league and they’ve played like the superior team against the Braves so far, but this is why the games are played on the field.